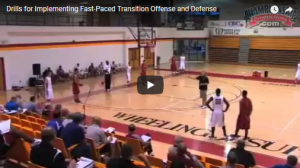 In order to help clarify our terminology and communication, I refer to going from offense to defense as conversion and from defense to offense as transition. I believe that every day as a part of your defensive work, it is essential to work on some type of conversion defense. In my mind being good defensively starts with being very good at converting to defense in order to force your opponents to play against your half court 5 on 5 full strength defense. A big part of being strong in the conversion aspect of defense starts with not turning the ball over and taking good shots. That allows you to apply your defensive conversion system. The video is a You Tube video, so please make sure that you are on a server that allows you to view You Tube videos. You might already use something similar to this drill. I like three things about the way the drill is set up in the video. 3) Coming back so that both teams get to convert each way. Make sure your sound is on as you watch. Click the arrow to play the video.